Saying thank you can be difficult in English. It’s saying the right thing at the right time. Today, I want to show you different ways to say thank you in English so you have exactly the phrases you need when you need them. Then you can thank me. The first is “definitely informal,” for when you’re hanging out with your friends in a cafe. Or by the canal. Or wherever you hang out with your friends. The second is “could be either formal or informal.” You can use these phrases with friends or even in most business situations. This is very British. It’s used to say thank you for small things — like when someone passes you the salt. “Ta” is very British. (In fact, you can only really use this one in the UK.) You can use it to thank people for small things — it’s light and friendly. If you want to show that you’re really thankful, but at the same time you want to keep things light, this is a good one. But you can also use this phrase with the opposite meaning. “What? You gave the kids coffee? Look at them … Thanks a bunch! You can use it sincerely (but lightly) or sarcastically. Thanks so much. / Thank you so much. Another classic. Like Casablanca. Or Fight Club. I often add “really” at the beginning to make it stronger. This is a classic. But the classics are sometimes the best, right? I mean — look at Casablanca. Easily the best film set in World War II Morocco. 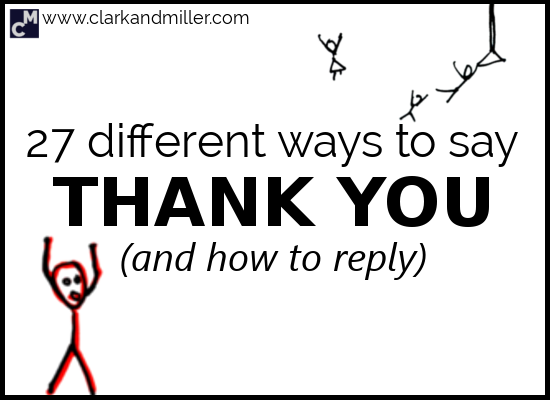 Another important point: You can use all of these with “for + -ing” or “for + noun” if you want to say why you’re thanking someone. A lot of the time, just saying “thank you” isn’t enough. Sometimes you feel really, really grateful, and you want to show that. So when you feel particularly happy because of what someone has done for you, you can add an “extension” with one of these phrases. Use it after one of the “thank you” phrases above. “You rule!” Such a nice thing to hear from someone. But what do you rule? Again — just so nice to hear from someone. If someone helps you and you call them “awesome,” they’re more likely to help again, right? For some people, suggesting that someone is even better than your best friends and closest family might seem a bit too strong. But don’t worry. This is just a phrase, and no one will think that you like them more than anyone else in the world. They’ll just feel happy that they helped you! Sometimes when someone helps us out, we want them to know that we’re there to help them out, too. OK. This doesn’t literally mean that you were touched by someone or something. So when someone has done something for you that you really weren’t expecting, and it kind of makes you want to cry, you can go for this one. Obviously you didn’t actually make my day. I mean — how does someone make a day? That’s nice to hear, right? What better way to show your appreciation than by saying so directly? This one sounds quite strong, doesn’t it? Definitely not one to us for small things, like if someone’s just made you some toast. This is for when you’re really, really, really grateful. You know when someone does something for you, and you want to tell them that you understand that it wasn’t so easy for them, but they did it anyway? That’s when you can use this phrase! Again — this is one of the big ones. Use it when you really are surprised and very, very, very grateful. Most of the time, we use this phrase when someone gives us a present. It’s short for “You shouldn’t have bought me a present” — even though we’re usually fine with the present. It’s just a ridiculously indirect way of being polite. Use this one when someone has done something more than they needed to — something that shows that they care. For those situations when you’ve achieved something, and you really want to show that someone’s help got you there. You’ll hear this one a lot at award ceremonies like the Oscars. No worries! It’s OK. Everything’s good. I use this one a lot. I like it because it keeps everything light and informal, which is just what you need sometimes. This is like taking the thank you and giving it back to the other person. I think in some cultures and some situations this might not be the most respectful thing, but in the right (friendly) environment, this can be just perfect. The pronunciation is key for this. Click to hear me say it. You’ve probably been using this one for years now, so you might want to try out some of the other phrases for a while. This one will still be here when you want to come back to it. This one is a little like the others on this list, but don’t use it for simple things, like when someone thanks you for passing the salt. Save this one for the bigger favours. Like when someone thanks you for driving them to the station. Or for building them that space ship they’ve always wanted so they can finally go and check out that restaurant on Saturn. So there we are — 27 different ways to say thank you (and reply to thank you) in English. In places like the UK, the US and Australia, it’s very, very common to thank people — even for the smallest things. We just like doing it. In other cultures, it’s not so common, and people only thank each other when they’re especially grateful. What about where you’re from? Do people say thank you a lot in your country? Or is it something you only do on special situations? Let me know in the comments! It’s great to hear about how things work around the world! Did you find this useful? Do you know any people (or dinosaurs) that might also benefit from this? Then BE AWESOME AND SHARE! Spread the knowledge! Another great lesson!!! I really appreciate your work. Thanks a bunch. Btw – do you still live in pLOVEdiv, Bulgaria? I grew up in this town and I’m going to visit friends and relatives in summer. Do you like Bulgaria, Plovdiv? Anyway, бъдете здрави и до скоро! Thanks so much for the positive feedback. It’s always good to know people are out there, enjoying our work and finding it useful. And yes! We’re still in Plovdiv and totally loving being here. One of the world’s best kept secrets! Especially in the summer. Thanks so much for your huage efforts it helped me alots. Thanks for the positive feedback. It’s great to hear that learners like you are benefiting from it. You’ve done it again. Brilliant! Thanks ever so much. In Bulgaria we often thank each other. It’s an easy way to make the day nicer. Yes, thanking people is a nice way to make the day go more smoothly. This might be something Brits and Bulgarians have in common. (We’re also very keen on apologising to everyone. About everything. All the time). Glad you enjoyed it, Marta. Thank you so much for your splendid lesson. I’ll try to make it known to more English learners around me. Looking forward to more great lessons from you. You star. I’ll just say that it’s really helpful, really appreciate your effort. Thank you. I’m English and surprised I didn’t know the finer details of saying thank you! Never really thought about the psychology behind a thank you. Interesting find, thank you! No … Thank YOU! For the excellent comment. Really useful! Thanks a bunch.. I must be grateful you for what you have done. This is the best gift from you. Thanks dear for your kind consideration. Realy you are awesome mam.